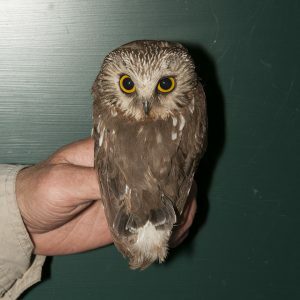 As we approach the end of the summer owl banding season, things have remained relatively slow, but fairly steady. We had begun to wonder if the owls were going to trickle down to the end of their summer movements when the night of the 18th produced a pretty unexpected surprise. 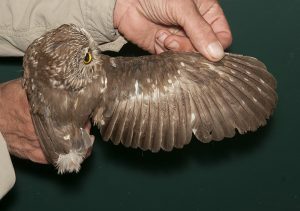 We banded six Saw-whets, five juveniles and one adult, and five Long-eareds that night. The best night prior to that was nine owls banded on July 2. The adult Saw-whet was the first we had banded since July 18. Every summer season we enjoy seeing some adult Saw-whets molting in their tails, but they we had stopped catching them earlier than usual this summer. The adult on the 18th, (photo above) was actively replacing all of its tail feathers. You can see the short tail feathers growing in above the white undertail coverts, which are visible from the upperside due to how short the new tail feathers are. It had also started replacing its wing feathers (photo below). It had dropped a lot of its greater upperwing coverts and started replacing its innermost secondaries. The adult Saw-whet starting to replace its wing feathers for the first time. 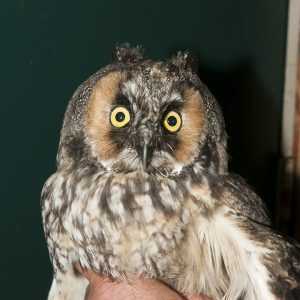 One of the Long-eared Owls on the 18th was so young it was still growing in its ear tufts (photo below). Chris Neri & Ryan Steiner.